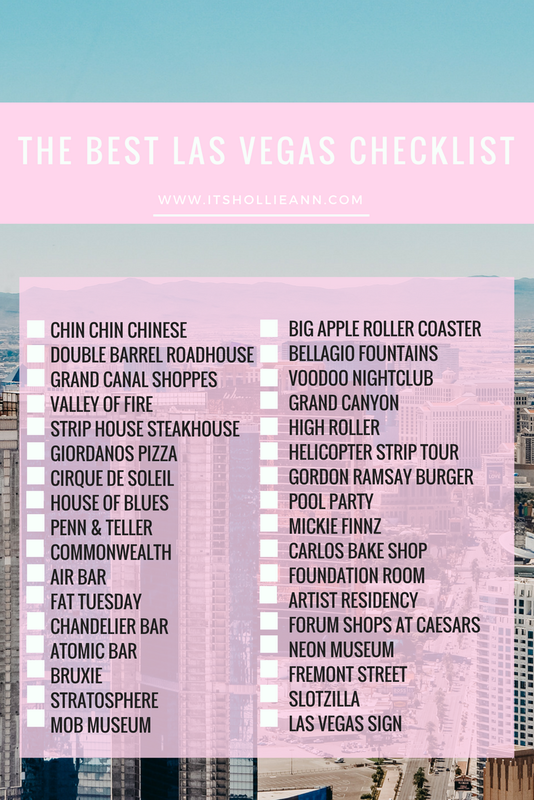 Before every trip to Las Vegas, I find myself researching, planning and writing post-it after post-it listing all of the food, drinks, shows and attractions that I want to check out. I compiled such a hefty list that I thought it was worth a share, not just of things that have come highly recommended but also things we've experienced first hand. I know that there are so many blog posts, websites and videos online dedicated to showing you the best things in the city but everyone's experience is different and the more recommendations the better. As a bit of background on us, we're not high rollers or fine diners, just two gals having fun in the best adult playground - Updated as of July 2018. Chin Chin, New York New York For Chinese & sushi. Hefty portions and deliciously spiced Chinese food. The Chili Beef was to die for and the Honey Shrimp balanced to perfection. One entree would be enough for two with a rice bowl or small side. Slice Of Vegas, Mandalay Bay For beer & pizza. Mouth watering pizza and extra strong cocktails. This place is a hidden gem and great value for money. The pizzas are definitely big enough to share and the locally brewed beers are great to sample. Bruxie, The Park For chicken & waffles. Allegedly the best chicken and waffle sandwich in town. We ate there three times on our last trip and each time, it was to die for. The Original is a must-try. If you're there early and fancying something more breakfast like, Holy Chicken is beautiful. If spice is more your thing, Kickin' Chicken is a great option. Also, the chicken is fresh and fried to order which is a bonus. Gordon Ramsay Burgr, Planet Hollywood For burgers. These burgers are stacked higher than I ever imagined and are incredibly juicy. Everything is cooked to order and brought out fresh - No sitting under heat lamps. Seating is on a first come first served basis but for groups of 3 or more, see the host first as they may be able to offer a specific time to seat you. Strip House Steakhouse, Planet Hollywood For mouthwatering steak. The red decor and mood lighting seem like something out of a movie and the cuts are cooked and seasoned to perfection. The wine list is incredibly extensive but servers are more than happy to recommend. Pricey but worth every penny. Giordanos Pizza, Ballys For Pizza. After Victoria's Las Vegas vlog, I can't get this place out of my head. They offer Chicago style pizzas in the heart of Las Vegas and are famous for their Stuffed Deep Dish variety. House Of Blues, Mandalay Bay For breakfast. Always a great setting for bacon and eggs with excellent music and attentive staff. I'd love to try their world famous Gospel Brunch which offers an all you can eat breakfast and a gospel choir. Amazing. Carlos Bakery, The Venetian For your sweet tooth. Cake Boss' Buddy Valastro's bake shop offering an amazing selection of cookies, cakes, cannoli - You name it. Well worth a visit to take out and enjoy later. Guy Fieri's Vegas Kitchen, The Linq For American comfort food. I was sold on this place the second I saw the menu. Guy has combined craft beer with delicious comfort food. The Original Ringer burger was so juicy and seasoned and my other half gave the Old School Steak Sandwich, 10/10. Commonwealth, Downtown For a relaxing setting. Cocktail lounge with live music and a rooftop bar. The festoon lighting for me, is the ultimate relaxation factor. The design and architecture was inspired by the pre-Prohibition era and it has it's own text-to-access speakeasy. Mickey Finnz, Downtown For Happy Hour. This beach themed bar is a favourite of ours for it's fab mid-week happy hour offers. They also have live music most nights of the week and are in a prime location for people watching on Fremont Street. The outdoor seating is also a bonus. Air Bar, Stratosphere For cocktails. Air Bar offer some of the the strongest cocktails I've ever tried, 800ft in the air. You do have to pay entry to the Stratosphere Tower to visit but it's well worth it since you can walk freely between the bar and the observation deck above. You'll never have another cocktail with a view like this. Fat Tuesday/Chonga Bar For convenience. Fat Tuesday have several locations up and down the strip whilst Chonga Bar is just in the Luxor. Both offer generous sized refillable cups filled with alcohol and slush. My favourite is the Chonga Bar tequila and pink lemonade. Sounds peculiar but it's ridiculously refreshing. Chandelier Bar, Cosmopolitan For style. Think of it like going to bar inside a chandelier that spans over three floors that all offer different menus. Atomic, Downtown For history. Atomic is Las Vegas' oldest freestanding bar. In its heyday it was frequented by stars such as Barbara Streisand and Clint Eastwood, looking to escape the hustle and bustle of the strip. Voodoo Nightclub, Rio For views. An open air club on top of the Rio hotel offering great music and spectacular views over the strip. It was an experience like no other and was definitely a great way to spend a Monday evening. Foundation Room, Mandalay Bay For atmosphere. Foundation Room is primarily a members only club but non members can use the dining room and enter the lounge after 10pm which isn't so bad. As mentioned in my photo spots post, this place offers amazing views looking north up the strip, 63 stories high. High Roller, The Linq The worlds tallest observation wheel. Offers a mean happy *half* hour. Stratosphere Observation tower complete with thrill rides, an observation deck and bar mentioned above. Whether it's day or night, the view is exquisite and the cocktails are perfect. Mob Museum Museum of Organised Crime and Law Enforcement located in Downtown. Slotzilla A zipline suspended above Fremont Street. Choose to sit (v uncomfortable) or fly like Superman! Neon Museum Home to neon signs from old Las Vegas hotels and businesses. Big Apple Roller Coaster Themed like a New York taxi, wraps around NY,NY and is absolutely terrifying. Bellagio Fountains An absolute must see and sometimes, a real tear-jerker. V impressive. Valley Of Fire Stunning state park not far out of the city known for it's bright red sandstone. Grand Canyon One of the Seven Wonders of the natural world and to this day, the most amazing thing I've ever seen. Whether you drive, fly or hike, you won't want to miss it. Seven Magic Mountains Seven towers of colourfully stacked boulders part of a public art piece by Ugo Rondinone and on show until the end of 2018. To the best of my knowledge, you do have to drive out to them. Helicopter Strip Tour Las Vegas is helicopter central so why not take a sunset trip over the strip in style. Be sure to research companies and consider safety before booking. Pool Party The majority of hotels offer daytime pool parties and most seem to have an act on throughout whether it be an artist or DJ. Marquee at Cosmopolitan and Wet Republic at MGM come highly recommended. Penn & Teller As a big lover of magic, I was so excited to see Penn & Teller perform. The show was incredible, their involvement and relationship with the audience was great and they even stayed for a meet and greet after the show. Lovely. Cirque De Soleil There are so many Cirque shows in Vegas and everyone recommends a different one. Michael Jackson ONE came highly recommended by a local as did KA. I'd love to see Zumanity but again, O also comes highly recommended. Residency Seeing a singer/artist/performer is really down to personal preference. We saw ventriloquist, Jeff Dunham on our most recent trip and you can bet that if Shania is ever back in town, I'm right there! I once heard that Las Vegas is one of the best places to shop in the world. I don't know how true that is but there really is something for everyone. Grand Canal Shoppes is quite upscale along with The Shops at Crystals. The Forum at Caesars is a more traditional mall but still houses the likes of Gucci, Chloe and Cartier. Las Vegas North Premium Outlets is a world favourite for outlet shopping. Sign me up. 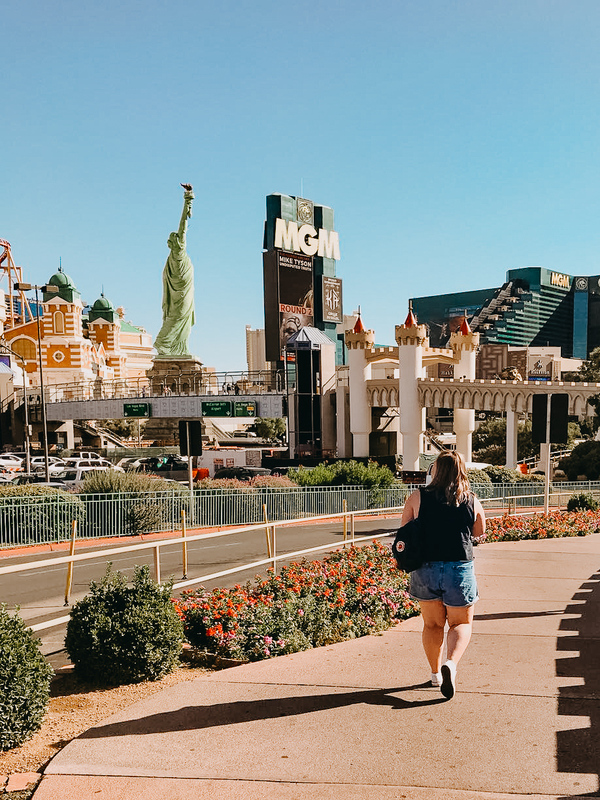 There are quite literally hundreds of places to stay in Las Vegas so there's something for everyone. We always stay in the Luxor but whether you would prefer to stay on the strip, downtown or in your own vacation rental, AllTheRooms will have you covered. There you have it, my top recommendations for all things food, drink and fun in Las Vegas. If you have anything to add, be sure to leave it in the comments, I'd love to check out some new places when I'm back in town. Below, just for you, I've created a checklist of the best bits from these recommendations. As with the details above, I've not included hotels to visit or where to gamble as those are completely personal preference. There is, however, a whole host of food, drink and entertainment must-do's that you're welcome to Pin or save for later.